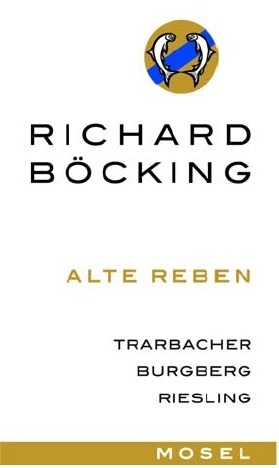 Richard Bocking Alte Reben Trarbacher Burgberg 2012 is 100 percent Riesling. This close-to-dry wine displays the perfect balance between pure, rich fresh fruit (pineapple, lemon and peach) and mineral flavors. Noticeable is a round and rich texture supported by focused slate. This wine can be enjoyed now and through 2015. Fruit: 100% Riesling Appellation: Traben Trarbach, Germany Vineyard: The fruit for this wine comes from our sustainably farmed vineyards covered in blue and brown slate and quartz. The Ungsberg is known for the extreme pitch of the slopes high above the Mosel River. This wine comes exclusively from old vines (40-60 years old) and from a single vineyard. Vines have been grown on this spot since the 16th Century. Harvest Dates: November 2, 2012; after the first frost. Production Notes: The fruit for this wine is deep, rich and intense, produced only from the best and oldest vines in this vineyard (40-60 years old). It is carefully hand picked later in the season to allow for ideal ripeness. All fruit is painstakingly hand sorted to allow only the best grapes to be crushed for the Single Cru. The juice is fermented by natural occurring yeast only- no added cultures- slowly at cold temperatures until the perfect balance of acidity and fruit is reached. The wine was aged sur lies for 10 months, then aged 100% German in oak barrels. This wine was bottled at the End of July 2013. Our story embraces Classic Viticulture on the steep slopes of the Mosel River Valley with a 15-generation family tradition. The extremely steep, slate-laced hillsides in the central region of the Mosel River offer optimal conditions for producing great Riesling wines. Since 1624 the Böcking Family has been devoted to producing wines of the highest quality – crisp, fruity wines that are the finest a Riesling enthusiast could desire. The roots of the Böcking family can be traced to the early 17th Century, when the family was appointed regional treasurer under Prince Pfälz-Zweibrücken. Soon thereafter, the family became active in the budding wine production and trading business in Trarbach, purchasing what may be the oldest Riesling vineyard on the Mosel, the Trabacher Ungsberg. The Trarbacher Schlossberg vineyard was acquired soon thereafter. The Böcking family has lived, loved and passed down the tradition of winemaking, along with portions of four steep-slope vineyards, to successive generations. It is their experience and dedication, combined with decades-old vines growing on rich, mineral soils, that allow the family to continue to produce the finest Mosel Riesling wines. Recently, Denman Zirkle and daughter Sigrid Carroll, a direct descendant of Richard Böcking purchased the Estate from a cousin, Wolf von Marschall. Denman, along with his daughter, Sigrid Carroll, Wolf’s sister, Leweke von Marschall, and the winegrower, Simon Trös, combined tradition and history with confidence and entrepreneurial vision to lead the family enterprise into the future and reestablish its international following. Their focus is on natural viticulture and production, developing mostly drier Riesling wines to suit contemporary tastes in Germany and abroad. In 2013, after almost 400 years, Böcking wines were introduced to the U.S. market for the first time. Importation into the United Kingdom began the following year. In Germany, Böcking wines are being distributed by several large merchants, including Weinkontor Freund ( http://www.weinkontor-freund.de ), one of the largest in Germany. Freund serves over 2,000 restaurants and retail clients, many high end. Until 2014, Freund specialized in wines from Italy, France, Spain and Portugal. When he added Germany in 2014, Richard Böcking is the only winery on the Mosel he chose to represent." In the United States, Böcking is represented by importer Kysela Pere et Fils, named Importer of the Year in 2013 by Wine Enthusiast magazine. The wines are currently being distributed in the Mid-Atlantic states, District of Columbia, and Montana. Please click here see where to purchase our wines. The character of the wines is shaped by the distinctive Grand Cru, steep slope vineyards of which Richard Böcking has 15 acres under cultivation. The plantings are 95% Riesling and 5% Spätburgunder (Pinot Noir). Of the five vineyards: Ungsberg, Burgberg, Schlossberg, Huenerberg and Taubenhaus, four are classified as Grand Cru with vintage vines up to 80 years old. The age of the vines force the roots of these grape vines deep into the ground for water and nutrition. Thus, the vines are constantly absorbing their nutrition, even during unseasonably dry periods. The constant nourishment provides vines that are strong, disease resistant, and produce small, compact grapes with an unusual concentration of fruit. Richard Böcking develops their wines by hand, from the vineyard to the bottle. Unadulterated; with an originality that can be produced only in a natural vineyard environment. From this tenet springs Böcking's fundamental philosophy—a philosophy of allowing a wine to develop naturally. In the steep-slope vineyards, this philosophy means the small vineyard parcels are cultivated individually and by hand. All wines are developed as bio-dynamically as possible, using naturally occurring yeast and introducing only the sparest amount of sulfur. This meticulous attention to natural agriculture and production creates beautifully finished wines while sustaining the vineyards for the future. The winter preceding the 2011 harvest was wetter and colder than the 30-year average. Budburst occurred as usual around 19th March and warm weather and rainfall in April produced vigorous growth. At the beginning of May dry conditions set in and there was little rainfall in eastern areas of the Douro Valley until late August. However the vines were able to draw from the plentiful ground water reserves built up early in the year and bunches developed and ripened in ideal conditions. Véraison (coloring of the grapes) occurred a little earlier than usual on 15th June. Mild weather in June and July was broken only by a heat wave in the second half of June. August was hot and dry, with perfectly timed rainfall on 21st August and 1st September rounding off an excellent ripening season and producing a well-balanced crop. Picking started in mid September in the Cima Corgo area of the Douro Valley. Fermentations were long, allowing balanced and complete extraction, and musts displayed intense color and powerful fruit character from the outset. Deep inky purple color. Intricate nose with aromas of blackberries and logan berries, subtle hints of amber and spring blossom and delicate spice. A tight, well-formed palate with an abundance of dark berry fruit, rich chocolate and liquorice, culminating in a long finish. Firm, closely woven tannins that give the wine great structure and body. An elegant finely constituted Vintage Port which will drink beautifully now or age quietly in the cellar. Simpily checkout with the number of gift cards you would like to purchase. On the checkout page, in the comment section, enter the recipient (s) Name, Address and email address. As well, feel free to put a gift note in the comment section. We will notify the reciept of the gift. You can also use the contact us page to email your recipient information.